Dermatitis herpetiformis, also known as Duhring's disease or gluten rash is a difficult condition to live with. It's an autoimmune blistering disorder which is characterized by itchy, burning and blistering skin rash, mostly affecting knees, scalp, elbows, back and buttocks. Dermatitis herpetiformis considered to be caused by allergic reaction to ingestion of gluten. Usually patients of dermatitis herpetiformis have celiac disease (Gluten sensitive enteropathy). Celiac disease is an autoimmune disease in which patient cannot digest gluten, a protein found in wheat, rye and barley. Some people may confuse it with herpes virus infection due to the name given to it but herpetiformis here is used due to the resemblance of skin rash to the blisters of herpes lesions. WHAT IS THE CAUSE OF DERMATITIS HERPETIFORMIS? As stated earlier, dermatitis herpetiformis is associated with celiac disease. Celiac disease can cause many symptoms such as nausea, adnominal pain, vomiting, constipation etc. When person with wheat allergy or celiac disease have gluten consisting diet it triggers autoimmune response mediated by IgA antibodies. Then these IgA antibodies get attached with the gluten and enter the bloodstream where they start clogging the blood vessels, especially small blood vessels in the skin. WBCs (White blood cells) get attached with these clogging structures which release a chemical known as complement. This chemical causes itching, blistering and burning rash on different parts of the body. This gluten allergy or sensitivity runs in the families. WHAT ARE THE SIGNS AND SYMPTOMS OF DERMATITIS HERPETIFORMIS? 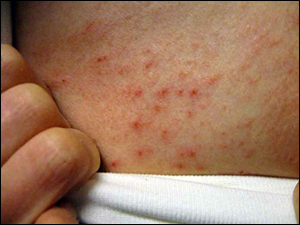 These rashes are usually similar on both the sides of the body and rash comes and goes often. Before complete flare up of the blistering rash there appears mild burning rashes with clear fluid which scratches off and heal. This process of skin rashes goes on for months and years or even sometimes goes into remission to return later. HOW CAN DERMATITIS HERPETIFORMIS BE DIAGNOSED? This disorder is diagnosed by skin biopsy. A small sample of the skin is taken and examined by doctor under a microscope. Second method to diagnose it is by direct immunofluorescence test. In this, a dye is used to stain skin around the rash which will mark the presence of IgA antibody. Blood test can be done to see the presence of these antibodies and an intestinal biopsy confirms the diagnosis by showing damage due to celiac disease. Dapsone is a specific antibiotic used for treating this condition along with gluten free diet. This antibiotic have serious side effects like liver ailments, anemia, sensitivity to light, muscle weakness, myasthenia gravis and peripheral neuropathy. In modern system of medicine dermatitis herpetiformis is considered to be a lifelong disease which cannot be cured. They recommend only gluten free diet to maintain for whole life. WHAT COMPLICATIONS CAN BE POSED IN DERMATITIS HERPETIFORMIS? If dermatitis herpetiformis is left untreated or maltreated it can even result in intestinal cancer due to continuous inflammation. Other common complications can be anemia and malabsorption of the nutrients in the intestines. Dermatitis herpetiformis is usually found to be associated with other autoimmune diseases like hypothyroidism, Sjogren's syndrome, vitiligo, rheumatoid arthritis, type 1 diabetes mellitus etc. WHAT IS AYURVEDIC INTERPRETATION OF THE DERMATITIS HERPETIFORMIS? According to Ayurveda all the autoimmune diseases are the result of accumulation of the "Ama", an undigested particles or toxins in the tissues or cells of the body. Immune system of the body recognizes this ama as the foreign body and tries to remove it from the cells. During the removal of ama certain chemical reactions follows and healthy cells also get destroyed resulting in autoimmune reactions. On the other hands there are three doshas in Ayurveda (kapha, pitta, and vata) imbalance of these three also leads to generation of various health issues. In the case of Dermatitis herpetiformis due to an imbalance in tridosha, excessive production of toxins in the body takes place. These toxins get accumulates in the different body tissues which further leads to the production of symptoms such as itchiness, rashes on the body. Planet Ayurveda comes up with the four wonderful herbal remedies for Dermatitis herpetiformis treatment. All the remedies are Ayurvedic and made from herbs of best quality. These medicines are free from chemicals, preservatives and additives and are not tested on any animal. All the remedies are purely vegetarian. 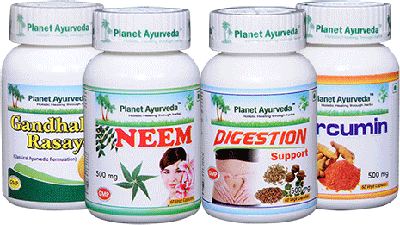 These capsules are prepared from authentic and standardized extract of Neem (Azadirachta indica). Neem is enriched with medicinal qualities, especially for the skin conditions. Neem capsules act as a blood purifier and remove toxins from the body. In dermatitis herpetiformis it cleanses the body and inhibits the abnormal autoimmune response of the body. This ultimately resolves the problem of skin rash. DOSAGE: Take 1 capsule twice a day after meals with plain water. Purified sulphur is used in preparation of these tablets and are full of antibacterial, antifungal, anti-inflammatory and anti-tumor properties. It is a wonderful remedy for skin complaints which helps to keep skin hydrated. Gandhak rasayan tablets removes the dead cells from the skin and keeps skin healthy and glowing. These tablets remove toxins from the body. DOSAGE: Take 2 tablets twice a day after meals with plain water. These are the single herb capsules prepared from Haridra (Curcuma longa). Turmeric or haridra is known for its rich medicinal content. Its anti-inflammatory property helps in relieving inflammation and associated symptoms also removes the toxins from the body. In dermatitis herpetiformis Curcumin capsules help in healing the skin rashes. DOSAGE: Take 2 capsules twice a day after meals with plain water. This is a herbal blend of Amla (Phyllanthus emblica), Haritaki (Terminalia chebula), Bahera (Terminalia bellerica), Sounf (Foeniculum vulgare) etc. As in dermatitis herpetiformis indigestion due to gluten intolerance is main cause, these capsules help in maintaining healthy digestion. These capsules rejuvenate cells and help in treating skin diseases. They strengthen the alimentary tract and relieve indigestion and acidity. 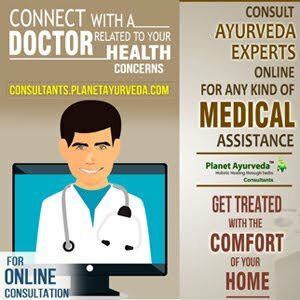 We at planet ayurveda provides the best combination of herbs in the form of herbal products. These products further interferes with the symptoms of Dermatitis herpetiformis and ultimately overcome these symptoms and treat the disease permanently.